Sluice Point is located at the southern tip of Nova Scotia, within the Argyle Township of Yarmouth County. 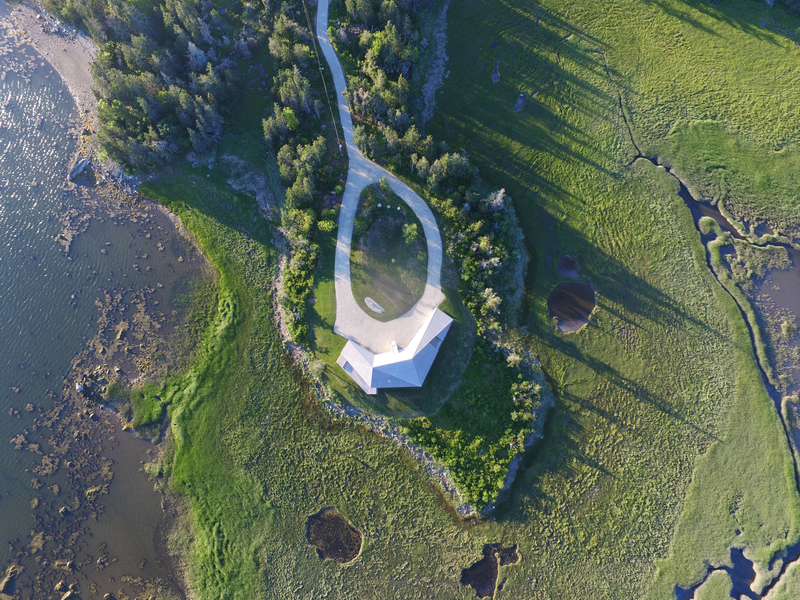 The site is located on a high and wooded point, adjacent to long and low views of marshes, small islands and the waters of the Tusket River in the Gulf of Maine. The coast is dotted with very few cabins and small, traditional houses, far from being overdeveloped with new buildings. 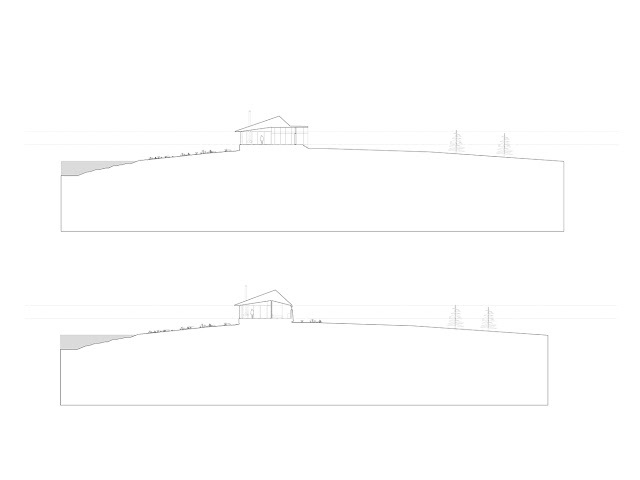 From the initial site visit, it was clear that any proposed building should be respectful. 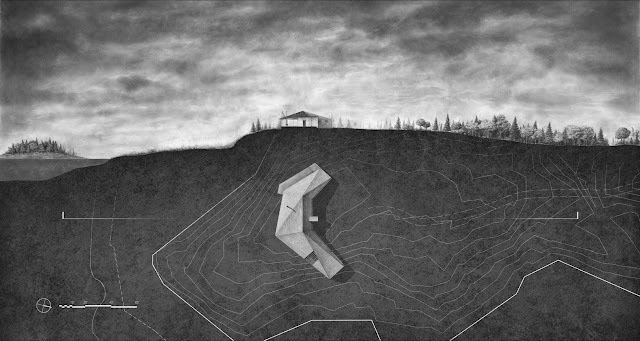 The shape of the building would be low, long and horizontal, and the palette of materials would be composed of natural and local materials, which would blend with the landscape. 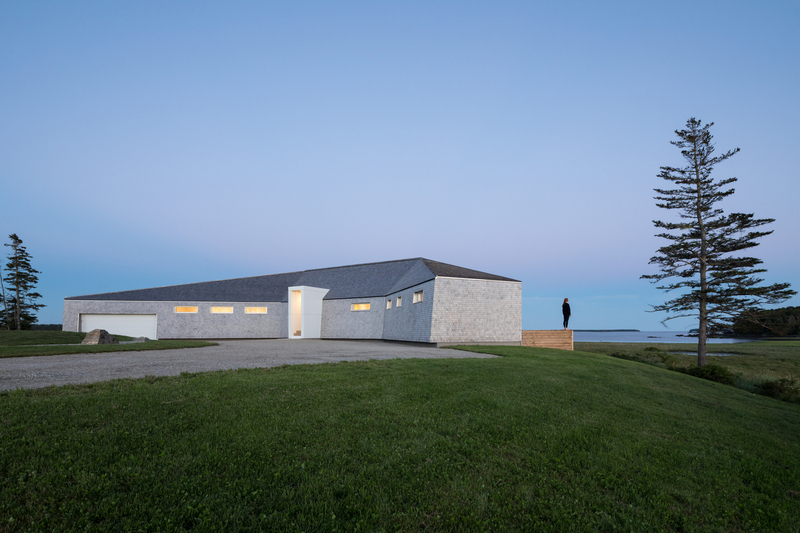 Formally, the building is inspired by the infamous Acadian saltwater barns, "une barge", which dot the local landscape. Historically, the haystacks allowed to store hay in the open marshes on structures that kept it elevated and protected from the water by the time the marshes were flooded. 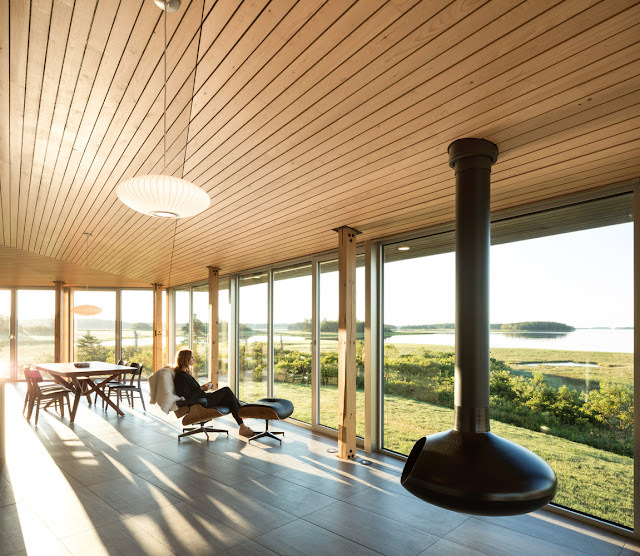 Customers are Swiss seasonal occupants, who use the home as an outlet for recreational activities such as swimming, fishing, boating, hiking and more. As such, it was crucial that the space be designed to be durable, resistant and easy to maintain. 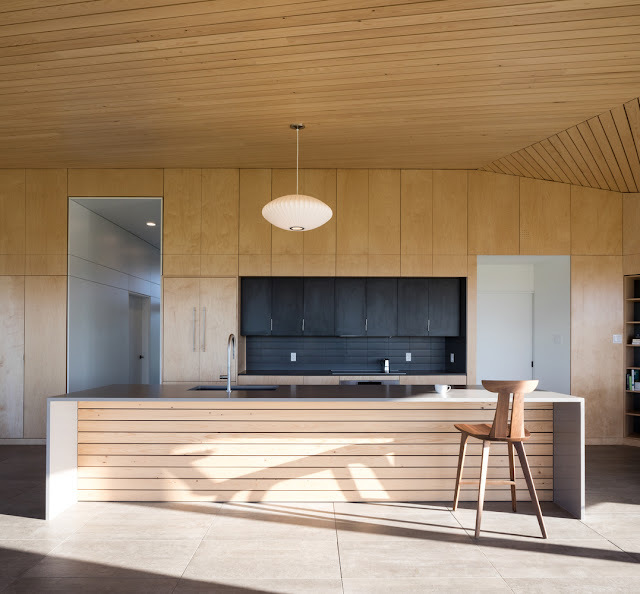 This was achieved by using a pallet consisting of natural and raw materials such as concrete and local wood siding. The client had several requirements that we could integrate in the early stages of the design. The large space of the room should be open, versatile and free of distractions when necessary to emphasize the exterior view. 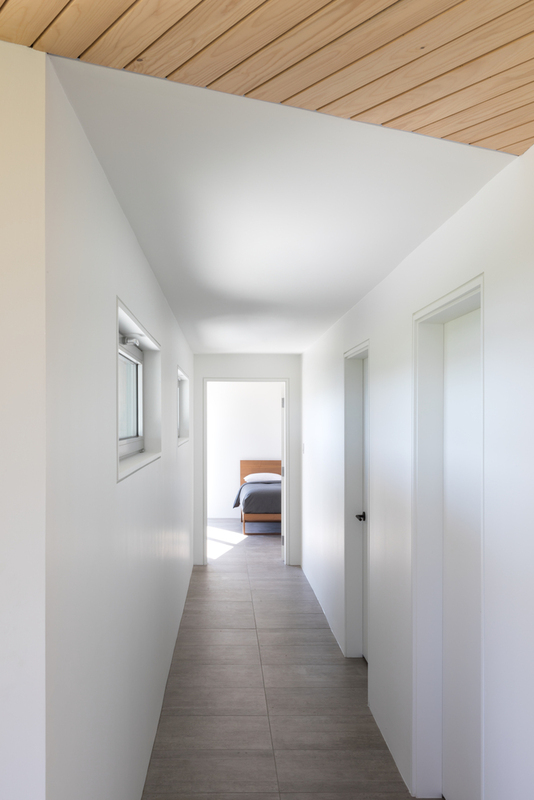 This translated into a space that could be transformed from a completely programmed interior space to one that was completely hidden and minimal. 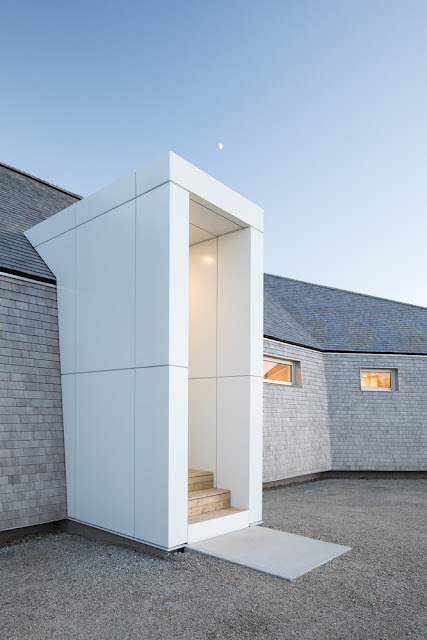 Flexible elements such as a series of sliding panels, barn doors and a central rotating chimney allow the center of activity and gravity to change easily and flow naturally. The program required open deck spaces and covered outdoors. One of them should be used as a deck for the mornings outside the main suite, where the client could enjoy a cup of coffee and enjoy the sunrise to the east. The second, a covered deck, was to be a space for nightly entertainment, an extension of the living room where occupants and guests could enjoy the revolving fireplace from a covered space that could extend into the high seasons. 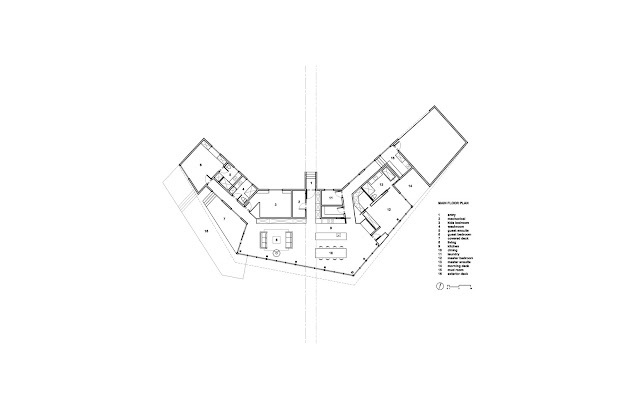 The semicircular design of the residence places the living areas along the side of the "views", while the services are located on the back of the floor. 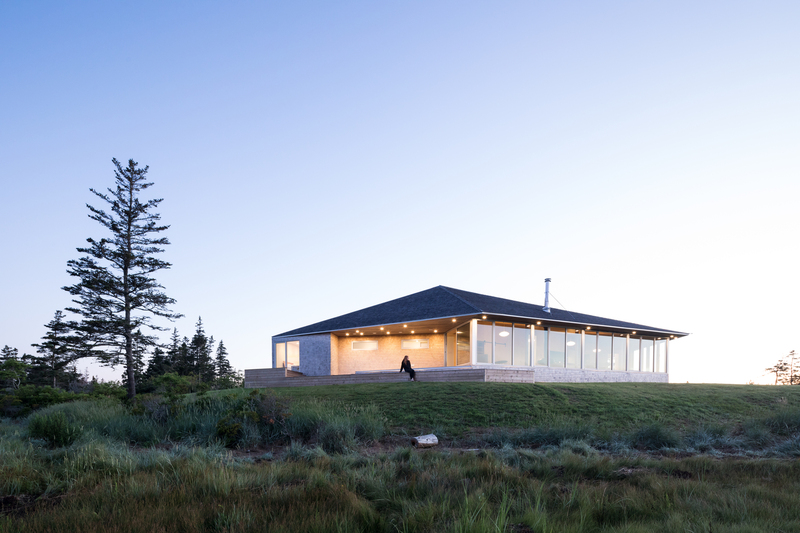 The structure consists of flanking bedroom wings and a large indoor / outdoor central room space that is entirely lined with local light fir and birch wood. The monolithic appearance has the feeling that the space is carved in the external form of wood. 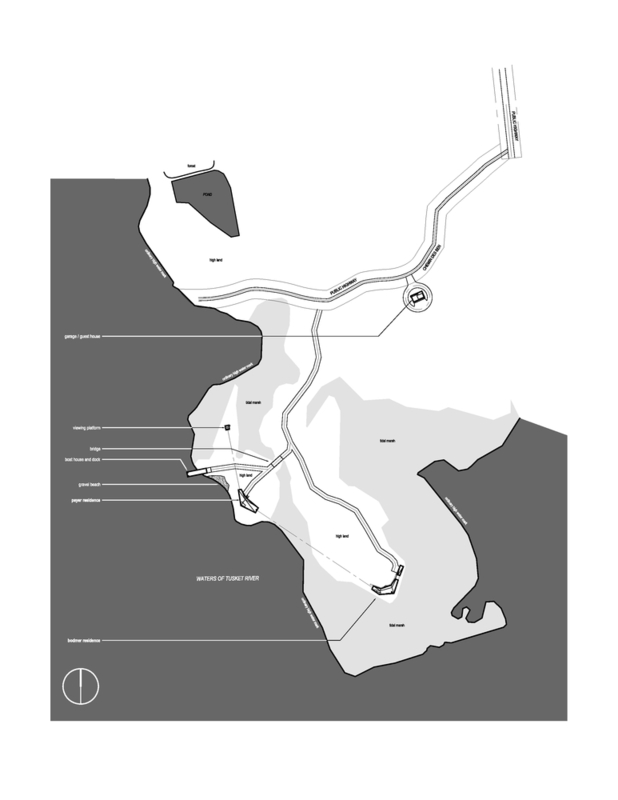 Materiality, form and location are intrinsically connected to the local condition. 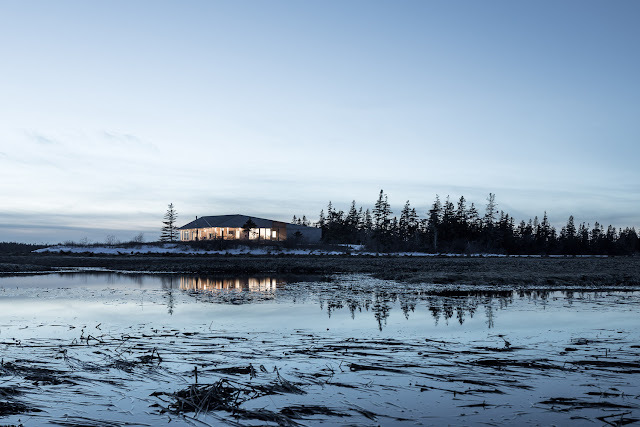 The economic roof of the shed is inspired by the local fishing sheds and shanties scattered along the Nova Scotia coast - with a smooth transformation. 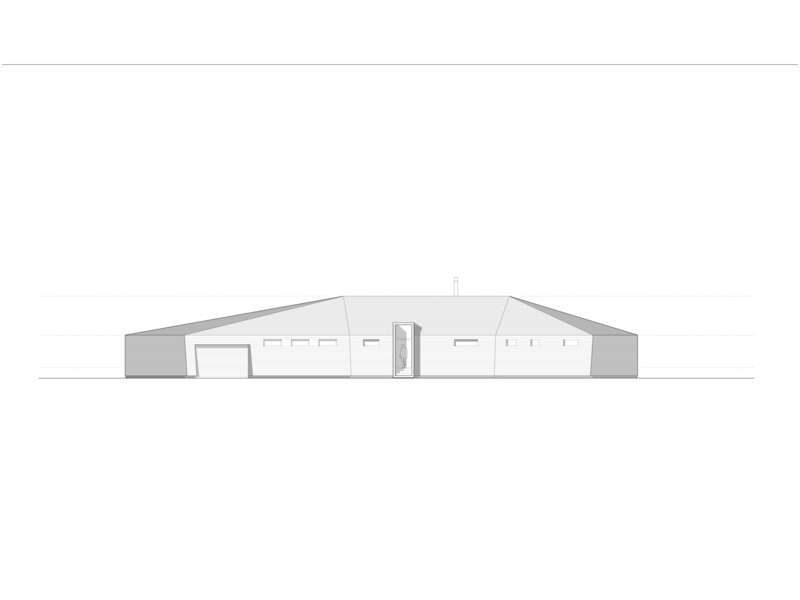 The roof frame encompasses the exterior walls, allowing a roof form as economically and efficiently as possible. 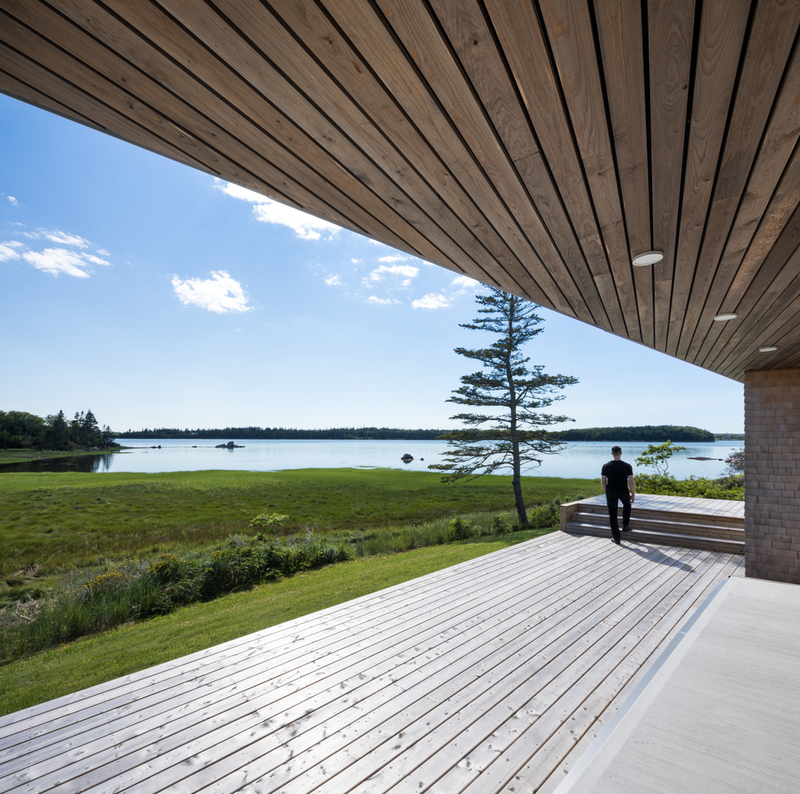 Both the wall and the ceiling are covered with the same white cedar from the east, of local origin, creating a shell of wooden shingles. 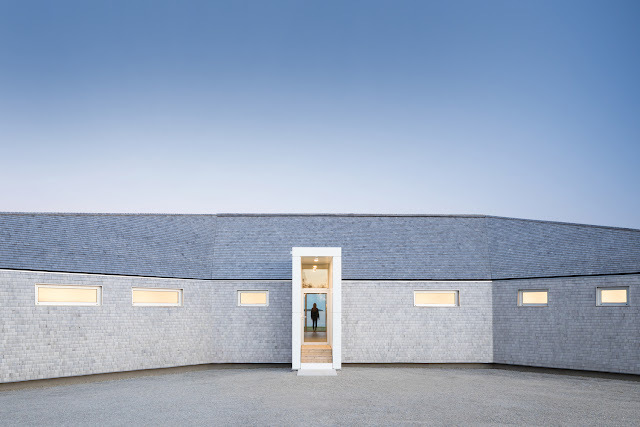 As one approaches the residence, one faces with a low ceiling, a gently inclined wall and a minimum amount of glass in the form of discontinuous dotted tape. 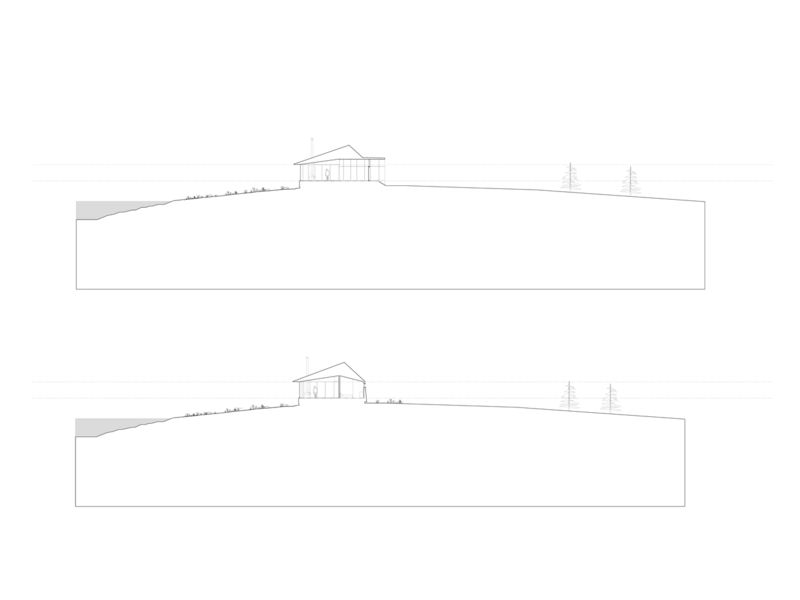 The vertex of the view is highlighted with a bright white arc, which marks the entrance and pierces the center of the house. The entrance arch is oriented with a high corridor, compressed on the sides. 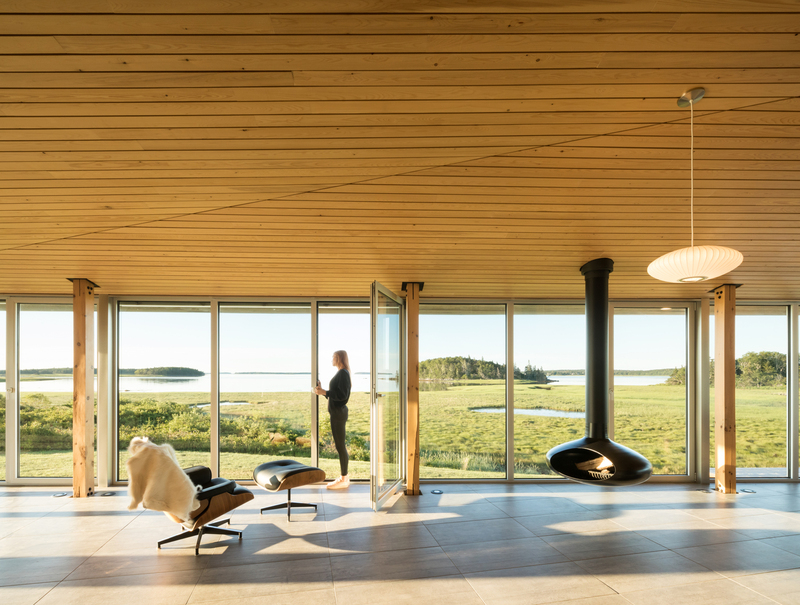 In extreme contrast, when one enters space, one passes through the threshold and enters the great room, where a long and low horizontal panorama of the marshy coast and the view towards the sea, with the points of the islands, is presented. Up to the point of entry, the panoramic view of the landscape is hidden from the visitor, since the width of the house hides a spectacular view. 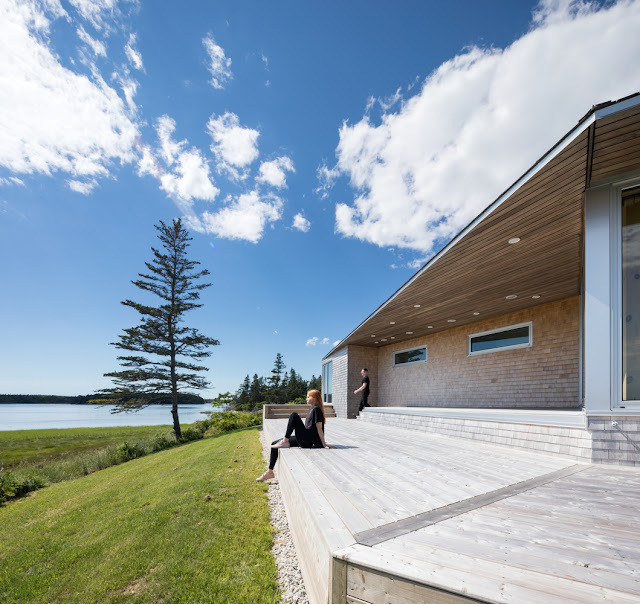 Omar Gandhi Architect Inc. is an architecture firm specializing in custom modern design based in both Halifax, Nova Scotia and Toronto, Ontario. The practice has become one of Canada’s leading young architecture studios. In 2013, the studio was the recipient of a Lieutenant Governor’s Award for Architecture in the first year of eligibility for Shantih. In 2012 Omar Gandhi and builder Deborah Herman-Spartinelli were recognized in the form of a Resolution from the House of Assembly of Nova Scotia for their collaboration on Cedar in Three Textures. 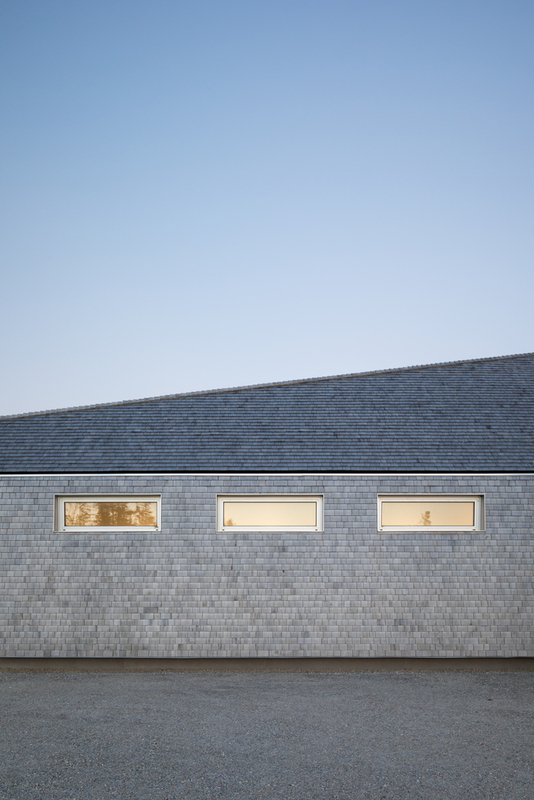 Their projects Black Gables and Moore Studio were selected by Phaidon Architectural Press as part of their online Phaidon Atlas. Since it’s inception in 2010, the studio has been the subject of numerous high profile publications including Wallpaper* Magazine, the Globe and Mail, Canadian Architect Magazine, East Coast Living, The Chronicle Herald, The Coast, Halifax Magazine, The Telegraph Journal and notable online journals including ArchDaily, Dezeen, Architizer, Mark Magazine and Design Milk to name a few. 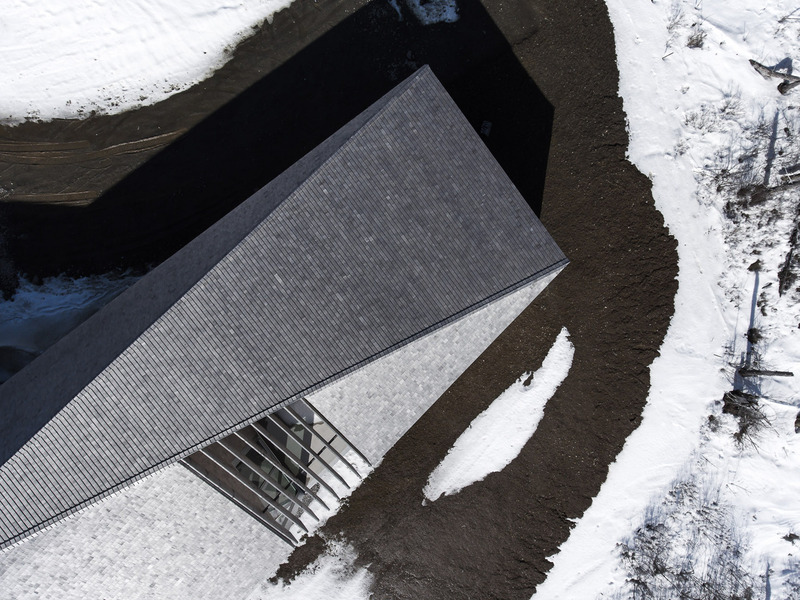 The firm was named as one of the Top 20 Young Architectural Practices worldwide in Wallpaper* Magazine’s annual Architect’s Directory in 2014, and most recently one of The Architectural League of New York’s ’Emerging Voices’ of 2016. The company believes that good architecture need not be expensive and that all buildings deserve to be thoughtful, healthy, and elegant environments for its occupants. Above all else, the studio serves to provide nice things for good people.